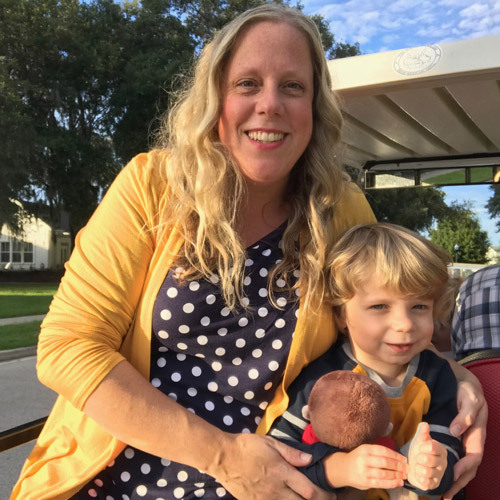 If you've spent a Happy Hour with me in downtown Orlando, then you know my love for the pudding shots at Lizzy McCormack's. I have no idea how they make them so much more like ice cream than pudding because sadly I've never had success in getting vodka to freeze properly. Which means the pudding shots at Lizzy's are clearly a result of witchcraft. Knowing that the magic ice-cream pudding shot recipe would remain elusive to me, I set out to perfect a pudding-pudding shot. After some experimentation I think I've nailed down a pretty stellar recipe! 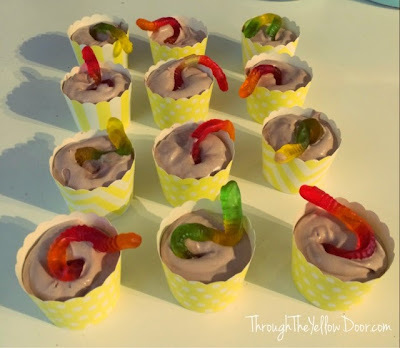 This recipe will make about 30 pudding shots, so they'd be great for hosting a party. Maybe for a Labor Day pool party?! 1.) 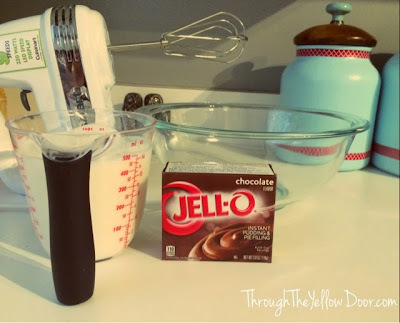 Prepare the chocolate pudding mix as directed on the box (add 2 cups of milk and beat with an electric mixer or whisk for 2 minutes). 2.) 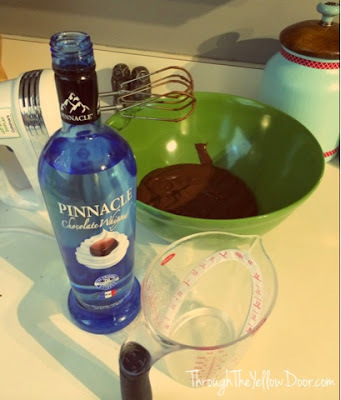 Add 1/4 Cup vodka (I used the yummy Pinnacle Whipped Chocolate Vodka flavor) to the pudding and mix for 1 minute (with an electric mixer or whisk). 3.) 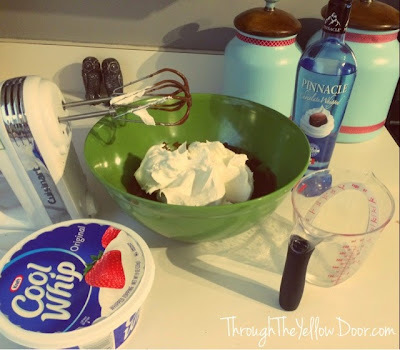 Next, add an entire 8oz container of Cool Whip and the remaining vodka (3/4 Cup) and mix for 1 minute (with an electric mixer or whisk). Drop spoonfuls of the pudding mixture into your shot containers. 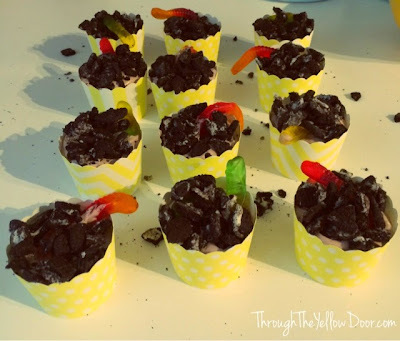 I had these cute yellow cupcake cups leftover from our "I Do BBQ" back in May) that I used. 5.) 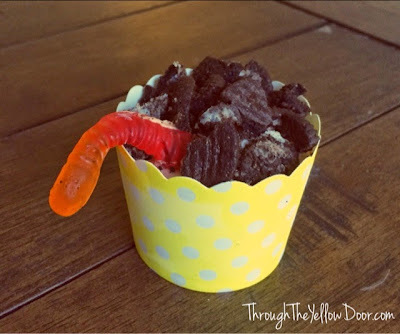 Add a gummy worm into each cup, making sure to push it down to the bottom so it will set properly in the freezer. 6.) 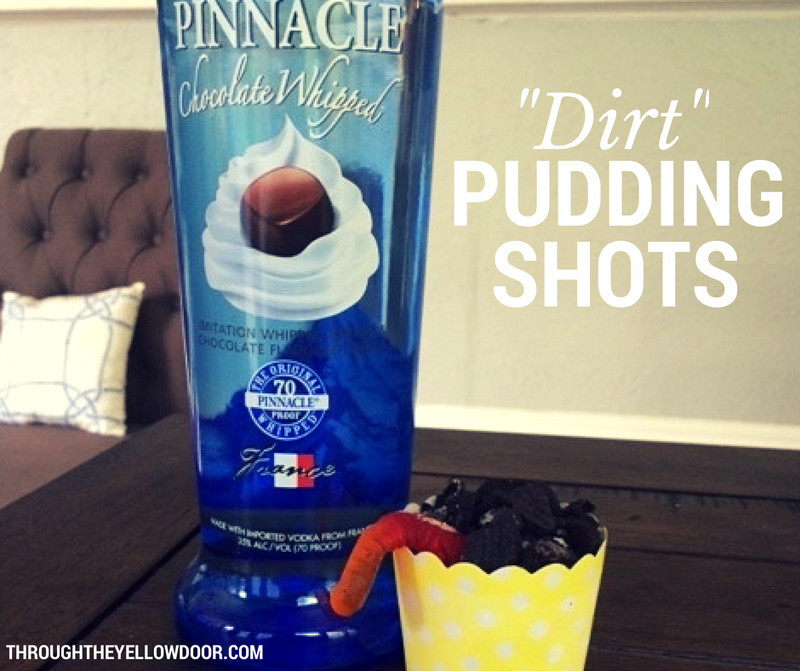 Crush up some Oreo cookies and add to the top of each pudding shot to complete the "dirt" look. 7.) Place in the freezer for at least 4 hours prior to serving! I tested these out on some girlfriends and the reviews were positive! Not too strong and delicious! 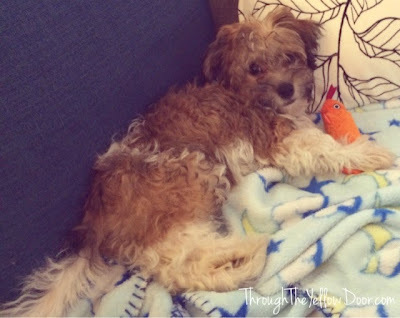 What a Weekend: Puppies and Turtles! Oh wow, what a weekend! This weekend was filled with new things and new starts. Meet Winston: the newest member of our family! 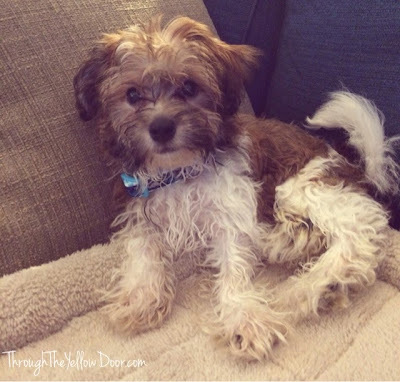 He's a precious 12 week old Havanese with the most adorable face! He only weighs 3.5 pounds right now and will probably only be about 12-15 pounds when he's fully grown. He's so tiny and squishy, I just want to cuddle with him all day. Which is good, because so far today there has been a lot of that. He is in the separation anxiety stage and he cries whenever we leave his side. This has made crate training extremely painful for Matt and I, though it's good training for real parenthood I suppose. Potty training is going well simply because I've been home and able to take him outside every hour. The day after we brought Winston home my husband was mowing the backyard and noticed more baby turtles had attached! 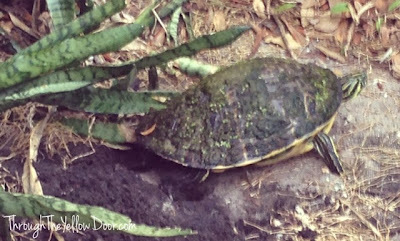 Back in May, (on World Turtle Day oddly enough) I noticed this hard-shell turtle laying eggs near our deck. I snapped a picture right away! I've been worrying about those eggs for 3 months! The wildlife in our backyard is insane and we kept finding remains of eggs around the yard from where raccoons had eaten them before they had a chance to hatch. For this reason, I loathe those raccoons! 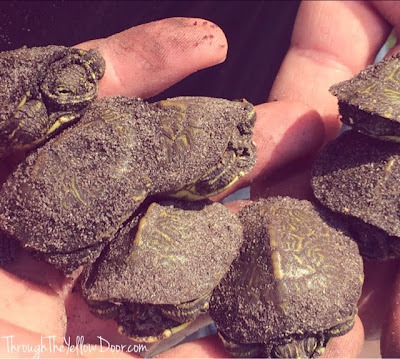 A few soft-shell babies did survive and they ended up in our pool last month, we rescued them and put them in the lake. 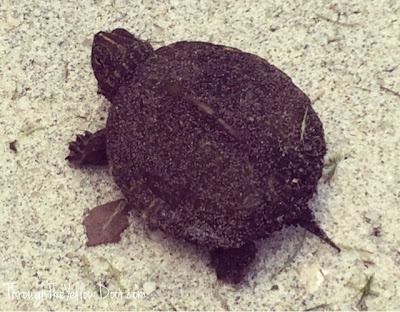 I wasn't sure if the hard-shell eggs by the deck had survived, so I was so happy to see 10 hard-shell baby turtles emerge!!! Seriously, it's such an awesome thing to see this happen. A new puppy and seeing 10 baby turtles survive, what an amazing weekend! 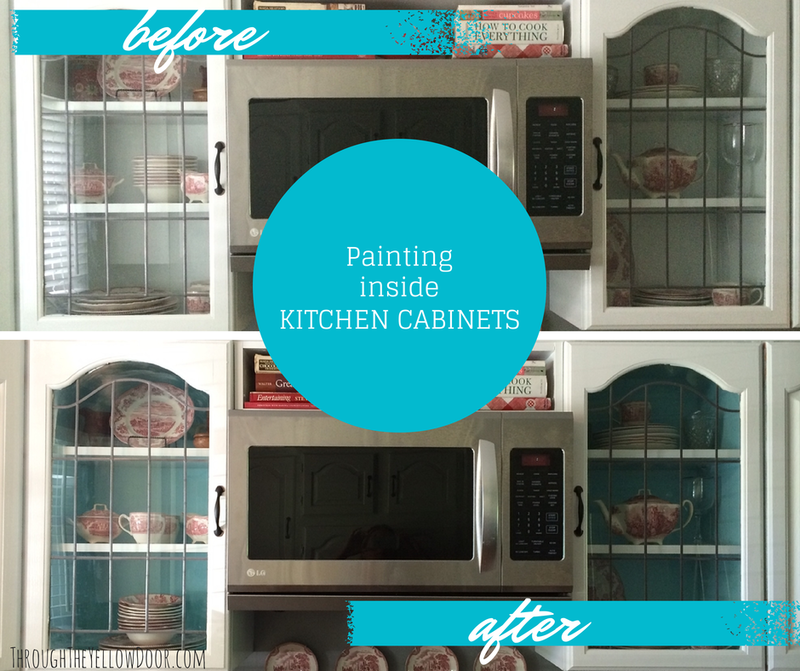 Kitchen Cabinets Project: Painting the Inside For a Pop of Color! Ever since I updated my kitchen canisters I've been dying to use the paint color someplace else in the kitchen. The light blue color compliments the kitchen table I hand-painted and obsess over, but doesn't match it perfectly. Which is just the way I like it, I don't like matchy-matchy, ever. I decided I would paint the inside of the kitchen cabinets with the glass doors. They are on either side of the microwave and directly above the revamped kitchen canisters (painted in the same color), perfection! I keep some of the pieces I collect (plates, cups, glasses, etc) in those cabinets and I thought they would look great with a light blue background. I used FrogTape to tape off the cabinets and protect the white paint (all the cabinets were painted white during our kitchen redo). I painted the inside of each cabinet with the light blue paint. It took a total of 3 coats to get the coverage I wanted. I let the paint dry overnight and in the morning I put the shelves back in. I could've painted these the same color blue (I've seen plenty of projects done that way), but I wanted to keep the shelves white to tie in the rest of the cabinets. I think it does make a big difference. It brings the blue from the kitchen table into this part of the kitchen and of course it looks great with the blue kitchen canisters! 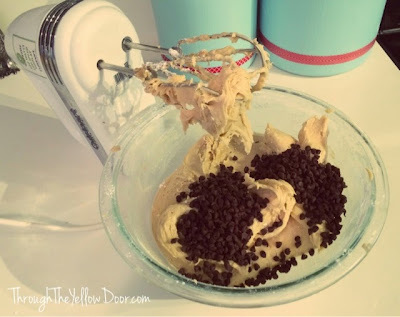 Chocolate Chip Cookie Dough Frosting! 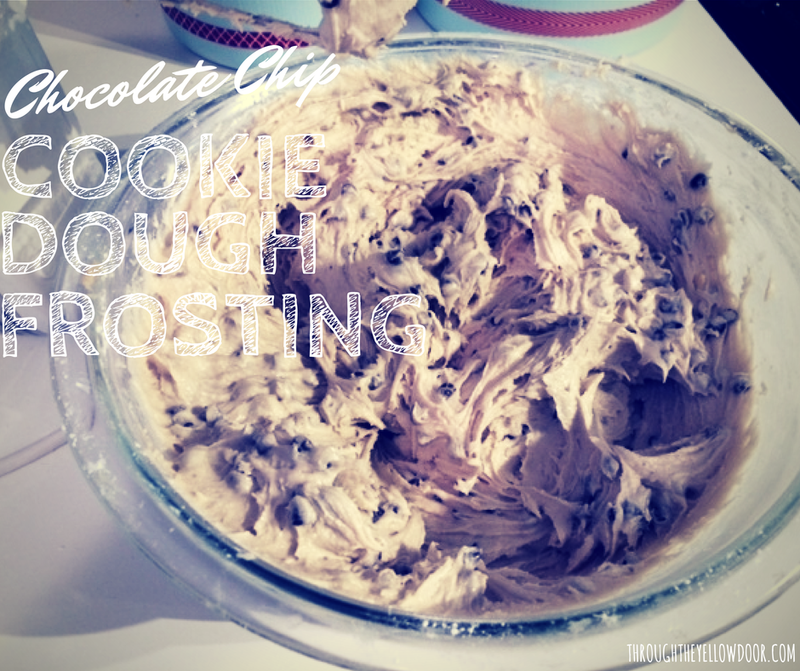 My lovely hubs found a recipe on Facebook for Chocolate Chip Cookie Dough Frosting (yes, frosting!) and was kind enough to request I make it. Never one to pass up a baking opportunity, especially one that involves chocolate chip cookie dough, I was more than happy to take the challenge. My in-laws were coming to town (3 of them were coming ALL the way from Italy!!) 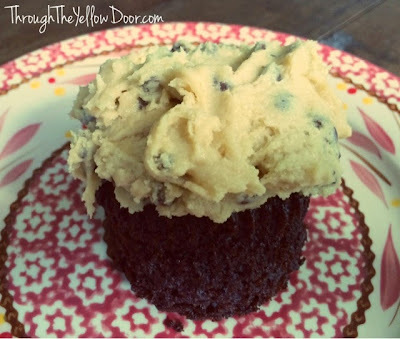 so I decided to make a batch of chocolate cupcakes and top them with the cookie dough frosting! 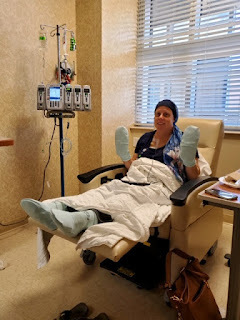 I was also happy to have people to give the baked goods to since our waistlines haven't been loving all the baking I've been doing for the blog this summer as much as our mouths have. I changed up the original recipe a tiny bit and doubled the quantities because I always run short on frosting (I must be a heavy handed froster). I also slackassed and just used a box-cake for the cupcakes, but since the real focus was the frosting they didn't really matter much anyway! 1.) 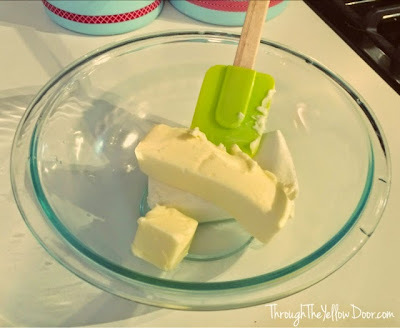 Put room temperature butter and cream cheese in a mixing bowl. 2.) Add sugar, flour, milk and vanilla and mix on medium speed for 2 minutes. 3.) Get your mini-chocolate chips ready, eat a few and enjoy. 4.) 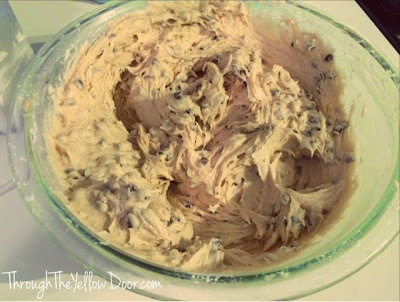 Add chocolate chips to the frosting and mix until well combined. 5.) 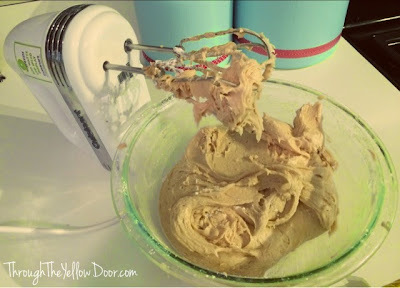 The frosting will look just like chocolate chip cookie dough when it's the right consistency (you may need to add more milk and/or sugar until you get it to a consistency you are happy with). 6.) Frost cupcakes with a HEAPING amount of frosting and enjoy! 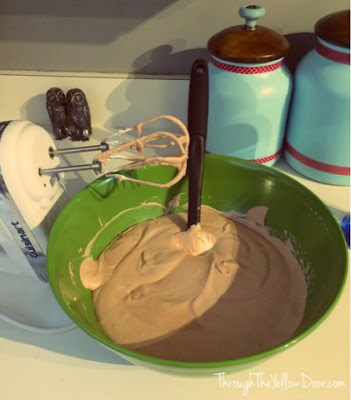 You guys, seriously, this frosting is AMAZEBALLS! 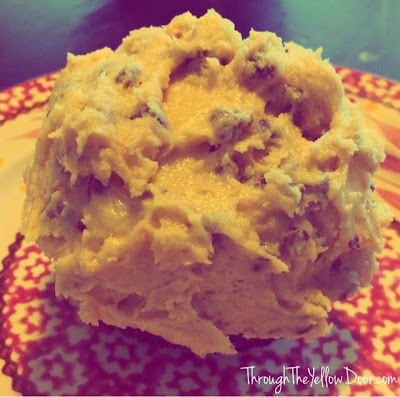 It tastes just like cookie dough! With this recipe, I'm linking up with with Coping with Frugality, Full Time Mama and Eat Drink & Be Mary, for Delicious Dish Tuesday! Don't forget to check out all the amazing recipes they featured this week!